The picturesque island state of Dominica in the Caribbean is a developing country that is attempting to diversify its economy away from a reliance of banana exports to the European Union (EU). It has a GNI per capita of US$6,440 (2012) and has seen GDP growth of 2.5% per annum 2008-12. A large proportion of the island is mountainous and less than 25% of the country is under cultivation. The dominant crop is bananas but this leaves the Dominican economy vulnerable to tropical storms and hurricanes, as well as fluctuations in the EU market. Diversification of the economy in recent years has seen a rise in eco-tourism to the island and the services sector accounts for 72% of GDP (2010). The economy of Dominica is based primarily on a single agricultural crop. But tourism is increasingly contributing more to GDP. Agriculture, together with forestry and fisheries contributes 13% to the country’s GDP (2010) and one of the most import private sector activities, and is a major employer. Major crops include bananas, citrus, mangoes, root crops, coconuts and cocoa. Forestry covers around 60% of the country. The direct contribution of travel and tourism in 2011 to GDP was 10%, generating 3,000 jobs, which is 9.2% of total employment (World Travel and Tourism Council). In 2007 Dominica had 87,000 tourist arrivals. 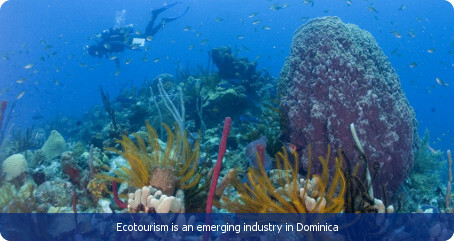 Dominica markets itself as the ‘Nature Island’, and is a significant player in the global ecotourism sector. The construction industry is experiencing growth, and as of 2008 it contributed 10.4% to national GDP. Much of this growth is due to its symbiotic relationship with the country’s infant tourism and construction industries, with hotels. There are no known oil or gas reserves on land or offshore. Dominica’s net imports accounted for 23% of GDP (2005). The average ad valorem tariff for imported goods is 9.9% (2008). Main imports include manufactured goods, machinery and equipment, food and chemicals; whilst major exports include bananas, soap, bay oil, vegetables, grapefruit and oranges. Major export partners include Japan, the UK and various Caribbean states; major import partners include Japan, the USA and China. In 2003 Dominica started a comprehensive restructuring of its economy in order to meet IMF targets. This included the elimination of price controls, privatisation of the state banana company and tax increases in order to overcome the country’s financial crisis. In order to diversify the island’s production base, the government is attempting to develop an offshore financial sector and is planning the construction of an oil refinery. Dominica is ranked 9th best in Latin America and the Caribbean for the ease of doing business, according to the World Bank’s ‘Doing Business 2012’ study. It is ranked 5th best in this region for protecting investors. These rankings measure the conduciveness of a regulatory regime in starting and operating a business. There are 780 km of roads, 50% paved on the English speaking Island. The airport cannot handle international flights and therefore tourists flying into Dominica must generally come via the nearby island of Antigua.